Origin and Habitat: Distribution: New Mexico (Chaves and Eddy counties), Texas (Brewster, Crockett, Loving, Pecos, Reeves, Terrell, Ward, and Maverick counties), and Sonora and Chiuahua, Mexico. Altitude: 1,000-1,100 m above sea level. Habitat: Grows in flat plains or lower hill slopes in semidesert grassland and open woodland in the Chihuahuan desert vegetation, usually on fairly deep, gravelly or silty soils, occasionally on rocky benches or bajadas on limestone or gypsum. 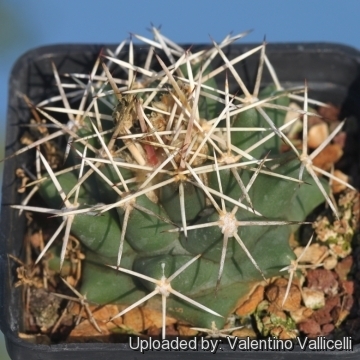 Description: Coryphantha robustispina subs. 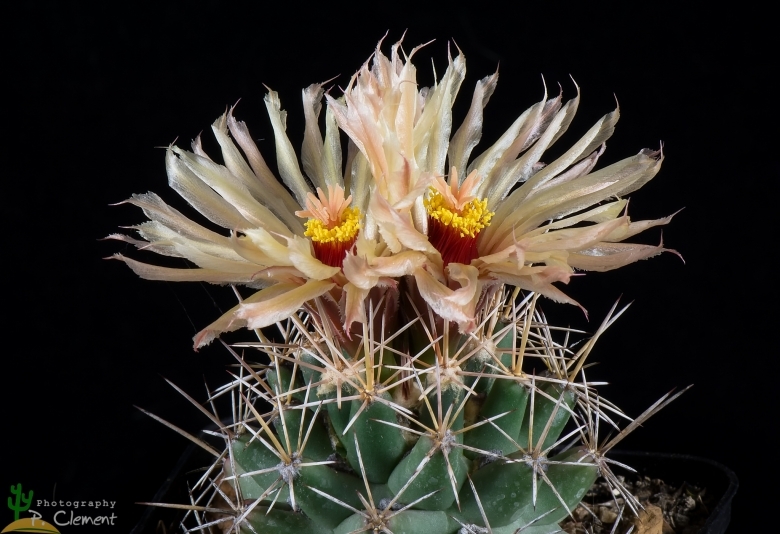 scheeri is a low-growing solitary (occasionally multi-stemmed) cactus related to Coryphantha sulcata. Stem: Hemispherical to egg shaped or somewhat conical, dull green, strongly tuberculate, 5-15 cm tall, 5-10(-15) cm in diameter or exceptionally taller especially in cultivation. Apex rounded wooly. Tubercles: in 5-8 series, 7-12(-30) mm long, 15-19 mm wide, conical to cylindrical, prisma shaped at the base, fairly firm, prominently grooved and thick with 1 to 4 reddish-brown nectar glands. Furrow deep and woolly. Axil: At first with white wool, then naked and broadened. Areoles: Woolly when young, oval approx 3-4 mm wide, 5 mm long. Central spines: Usually one (but up to 4) the dominant straight (sometime bent toward the apex), subulate (1,5)2,5-3,5(-5) cm long, the other straight upwards, slightly spreading outwards, slightly darker than radials. Radial spines: (6-)8-13(-16) straight stiff, needle-like, yellowish to creamy-white with darker tips. Lower one often brownish (1-)2-2,5(-3.5) cm long, some upper radials often thinner, much like the central spine and closer set, the other horizontal spreading and radially arranged. Flower: Funnel-shaped, silky, dark golden-yellow to greenish-yellow, rarely streaked or blushed with reddish in centre, 4-6.5 cm long, 5-7 cm in diameter, yellow stamens yellow to orange. Blooming period: April-July, and possibly to as late as November. Fruit: Green, ovoid to club-shaped, 3.5 to 5.5 cm long , 1.2 to 2 cm in diameter, the pulp juicy, sweet and mucilaginous, flowers remnant deciduous when mature. Seeds: Brown, nearly smooth, about 2-3 mm long, somewhat flattened and kidney-shaped, with a lateral hilum. 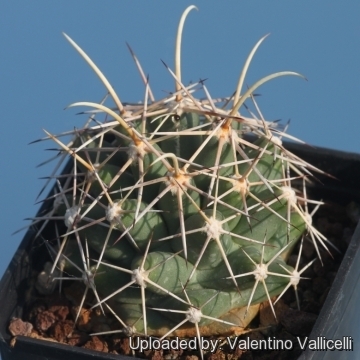 Cultivation and Propagation: This plant grows in the same habitat as Echinocactus horizonthalonius, with which it has some cultivation problems in common: slow-growing, seldom reaching the same size as in nature, sensitive against over-watering (does better when grafted). Water sparingly. It needs good drainage. Keep drier in winter. Full sun to partial shade. In humid conditions, the exudation of nectar (if not completely removed by ants) can cause the formation of mould, which leads to ugly black-colouring of the epidermis. 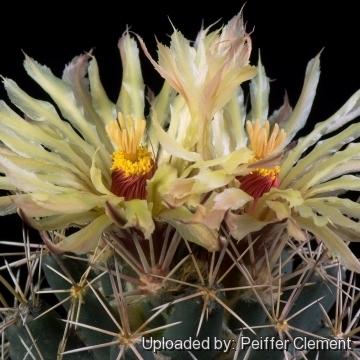 To prevent this, spray the plant with water to remove the nectar. And provide very good ventilation. 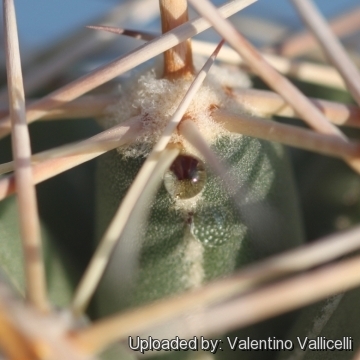 Frost hardiness: Can withstand temperatures down to -6,6º C. (or less for short periods).